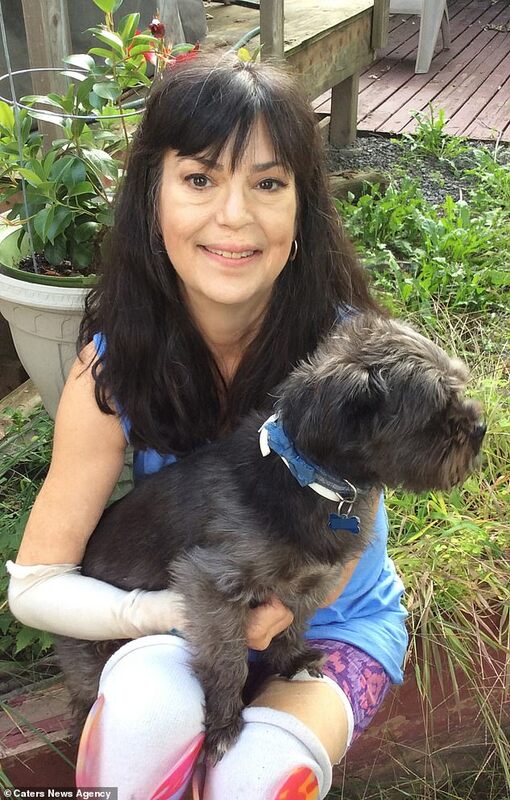 A mother-of-four became a triple amputee after her dog bit her and triggered life-threatening sepsis. 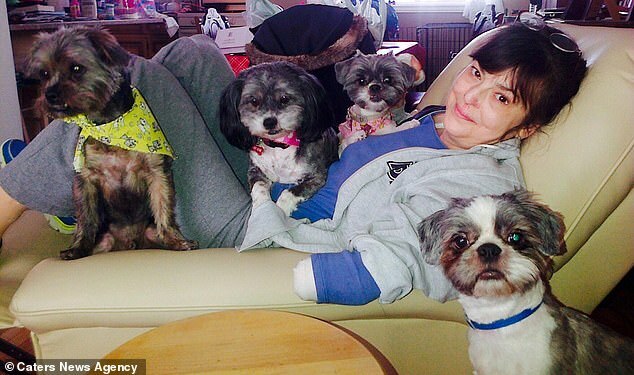 Christine Caron was playing tug-of-war with her four dogs on May 16, 2013, when her three-year-old Shih Tzu, Buster, accidentally bit her hand. Ms Caron, of Ottawa, Canada, went to the hospital six days later after suffering flu-like symptoms and vomiting overnight. She collapsed on arrival. She woke up from a coma three weeks later to find out she was battling sepsis – the body’s response to an infection, thought to have been from a dog bite. The 55-year-old was told that she would need to have her right arm and both legs amputated, as sepsis can cause tissues to die. Ms Caron has since been learning to live with prosthetics and now does all she can to raise awareness for sepsis. Ms Caron said: ‘I was just playing with my dog in the garden when he accidentally nipped my hand. ‘I didn’t think it would be an issue as I had cleaned it immediately and it didn’t become infected. On May 21, Ms Caron felt extremely weak, winded and nauseous while at work, so went home and fell asleep on the couch. HOW CAN A DOG BITE CAUSE SEPSIS? Bites and scratches can result in a bacterial infection which occasionally can trigger sepsis. An animal bite that breaks your skin exposes you to multiple bacteria, both from bacteria that may be on your skin and bacteria in the animal’s mouth. If the bite barely breaks the skin, you have a better chance of cleaning the wound well. Dog bites are the most common ones related to pets, but cat bites cause around 15 per cent of animal bites in the US. At first, they may not appear to cause as much damage as dog bites, but their smaller teeth and deep punctures can make it hard to clean a wound out properly. If you have been bitten or scratched by an animal, be sure to clean the wound thorough with warm running water. Keep the wound clean and dry until it is scabbed over, to reduce the risk of infection. According to the Centers of Disease Control (CDC), there are approximately 4.7 million dog bites in the United States over the course of a year and almost 800,000 people need medical care as a result of a bite. After trying to sleep it off, Ms Caron woke up at 11.30pm with what she thought were flu symptoms and went to the hospital the following morning. Symptoms of sepsis include slurred speech or confusion, extreme shivering or muscle pain, not passing urine, severe breathlessness, and having mottled or discoloured skin. Ms Caron said: ‘I collapsed in the emergency room at 7am. ‘The next thing I knew I was in the hospital being awoken from an induced coma on June 13. An animal bite can cause an infection as it allows bacteria found in their mouths to penetrate deep into the skin. Sepsis can cause the blood’s clotting mechanism to go into overdrive and cause blockages inside the blood vessels. When blood can’t pass through the blood vessels, oxygen and vital nutrients can’t get to the body’s tissue. The tissue can die and need amputation. 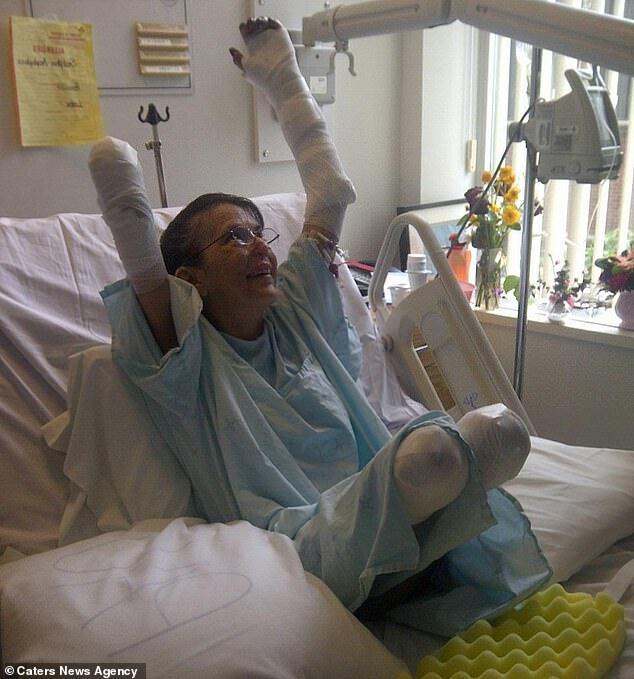 The sepsis had ravaged three of Ms Caron’s limbs. But, after regaining circulation in her right arm, she was told she would be able to carry on using it. She said: ‘I was initially told that I would have to have all four limbs amputated, but by some miracle the circulation came back in my right arm – and this provided me the little glimmer of hope I so desperately needed to survive. ‘My legs were amputated below the knee on the June 22, and finally my arm was amputated below the elbow on the 26th. Ms Caron was discharged from hospital to the rehab centre on July 8 and by the September, she could walk assisted with her prosthetic legs. On December 18, she was discharged from the rehab centre. 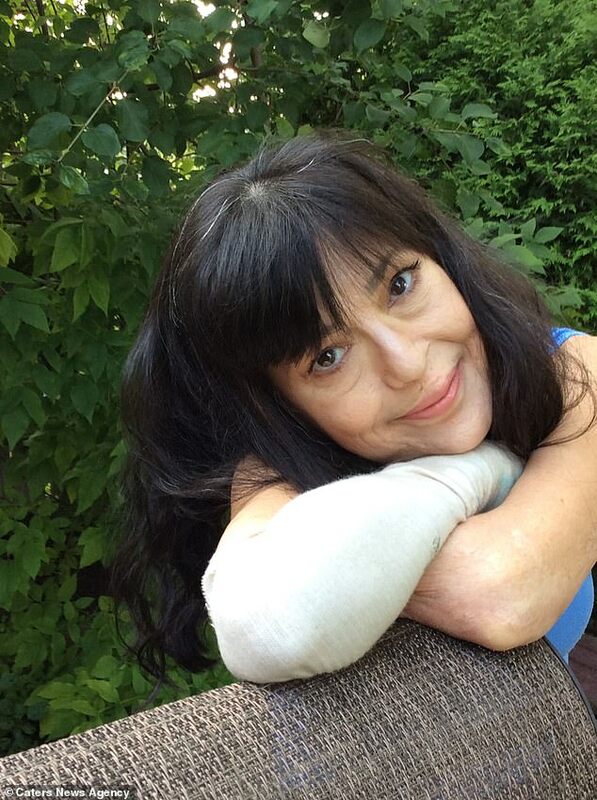 ‘But it wasn’t until 2017 that I received my passive left prosthetic arm,’ Ms Caron said, although it is not clear why it took several years. 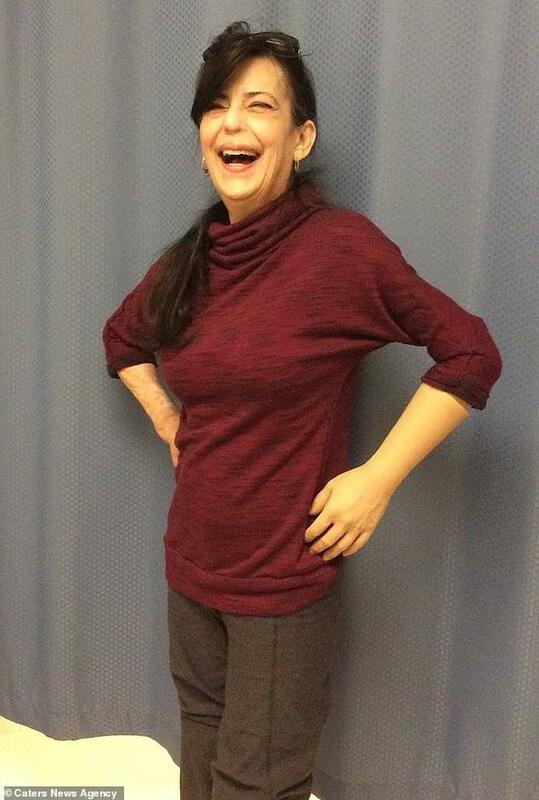 Ms Caron is pleased that she was able to eat with more normality as the prosthetic arm is able to perform basic tasks. 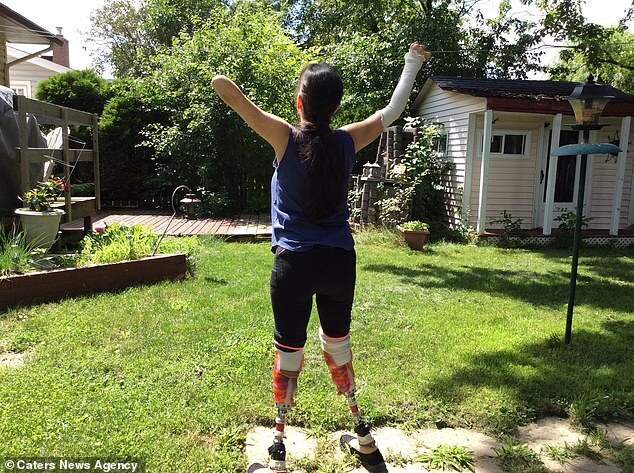 Despite becoming a triple amputee, Ms Caron explains that she is now making the most of being alive. Worldwide, one-third of people who develop sepsis die – at least 46,000 people in the UK and 250,000 people in the US die as a result of sepsis every year. Many who do survive are left with life-changing effects, such as post-traumatic stress disorder (PTSD), chronic pain and fatigue, organ dysfunction and amputations. Ms Caron said that yoga, her family and raising awareness for sepsis helps her live every day to the fullest. She said: ‘Over the years I have been working on becoming active again after the mental impacts of surgery stopped me. ‘My initial goal was to make it to my 50th birthday, and that was five years ago. My new goal is to focus on helping to spread as much awareness as possible about sepsis and the issues post-sepsis syndrome – the condition most sepsis survivors are left with. Sepsis occurs when the body reacts to an infection by attacking its own organs and tissues. Some 44,000 people die from sepsis every year in the UK. Worldwide, someone dies from the condition every 3.5 seconds. Sepsis has similar symptoms to flu, gastroenteritis and a chest infection. Under fives may be vomiting repeatedly, not feeding or not urinating for 12 hours. Anyone can develop sepsis but it is most common in people who have recently had surgery, have a urinary catheter or have stayed in hospital for a long time. Other at-risk people include those with weak immune systems, chemotherapy patients, pregnant women, the elderly and the very young. Treatment varies depending on the site of the infection but involves antibiotics, IV fluids and oxygen, if necessary.